The faculty of the department consists of 1 Professor, Two Associate Professor, 2 Bsc MLT Technicians, 6 DMLT Lab Technicians and other required numbers of subordinate staff. The department is undertaking teaching of MBBS, Bsc Nursing, General Nursing and DMLT students etc. The department 4 is carrying out routine bacteriological culture tests on all specimens and the fungal and M.tuberculosis culture tests. Apart from the routine serology tests like Widal, VDRL, RF,CRP we are also doing Special tests like Elisa for HIV, HBsAg, HCV, Dengue IgM, Lepto Igm,TPHA for syphilis. Western Blot confirmatory test for HIV. The department is equipped with special equipments like Dark ground microscopy, BOD incubator for fungal culture, Deep freezer, Biosafety laminar flow working benches apart from the conventional instruments required for teaching institution. The department is conducting theory and practical classes on Microbiology for II MBBS students, B.sc Nursing, DMLT students and MHA course. Biological, Fungal and Mycobacterium tuberculosis culture of the various specimens received in the laboratory are performed routinely and reports are given under the supervision of microbiology faculty. Other tests done and reported are the routine serological tests like widal test, RPR for syphilis, Rheumatoid factor and CRP. ELISA tests are done for HIV, HBsAg, HCV, Dengue IgM, hepto IgM, ANA and ds DNA. Quality of water samples from different sources are routinely tested and also from dialysis unit. 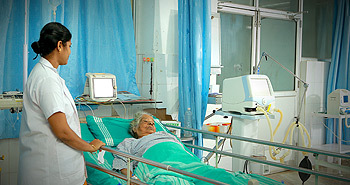 Surveillance of Operation Theatres, ICUs and Blood Bank are routinely conducted.